As this is your first post you should do a little introduction about yourself. With a 21' boat you somewhat limit yourself. Most of the lakes around Sudbury are too small or too shallow. Were you boating in the North Channel? There is a ton of places to launch on Manitoulin Island. You could come to Nipissing. If you launch at Sturgeon Falls it would only be 40 minutes from Sudbury. Hi i live in Sudbury as well. with a boat like that you may want to try Wanapitei lake. I know there are launches but not sure were the all are, but i do know of the one at Rockey's but that's a drive. I will ask a friend were to go a launch since he fishes that lake. There is also the Vermilion river and lake,whitewater out in azilda. Sorry about not introducing myself. I am Kevin, I live in lively, I have a 21 ft tempest with a 350 in it. All if my boating has been the north channel of Huron, and a few years ago I was a salmon guide in meldrum bay. I don't really fish much anymore, mainly because I do not know where to go to catch anything. I also have a 15' aluminum center console that if I can find some decent fishing holes I would take it out to. I am mainly looking at doing water sports and cruising. I would like to do peonage but I do not know where the trouble spots are etc. Welcome aboard Kevin. With you little boat you can fish bass all day on Ramsey Lake. You can travel a little and fish Ratter Lake with it too. Nepawassi Lake is great for pike. JUst open google maps and hit the satelite imagry and you will find 100s of lakes within 30 minutes of Sudbury. Up around Capreol there are quite a few lakes. the problem i have heard with ramsey is there are alot of rocks etc to take a bottem end off, i worked at a dealer in sudbury for 3 years and many many people were coming to buy props because of ramsey and some bottom ends as well, im just too worried to go into waters that dont have charts, and that i am unfamiliar with. my big boat is down right now with engine issues so i do not want to take a bottom end out too. Onaping Lake up the 144 is a big lake 48 miles long, it does have it's rocks and shoals like any shield lake. There are downloadable maps of the Lake, there are lots of unspoiled areas in the northern section and lots of places to camp. 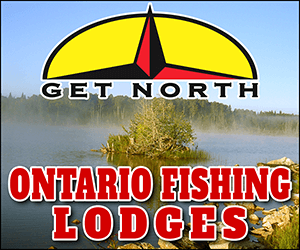 It has good Walleye, Pike, Bass and Lake Trout in the deeper sections.